Today I was at Partizan in Newark. We arrived around 10:30 and there was a massive queue waiting to get in. While we were waiting I did some business with an eBay re-seller of my acquaintance and sold a rather large and very old Wars of the Roses army that'd been lurking under my table for 20 years! It saved me the hassle of putting them up on eBay myself and I probably did as well out of it as I would have if I'd done that. Anyway, on to the show. I took rather a lot of photos so the 'report' will be broken down into two posts. First impressions were very good. In summary there were lots of high good quality games, several that were outstanding, and the place was bustling with punters. The hall was well laid out (well I thought so) with enough space to get between games and traders with my walker. My two favourite games are shown first. Graham of Cran Tara Miniatures put on an excellent game in 28mm set in the War of the Austrian Succession which was showcasing his extensive range of lovely figures. I might have these photos out of order but the game was a colourful English vs French engagement and looked outstanding. The terrain was very well done, with painted teddy bear fur (no teddy bears were hurt in its production I am told). 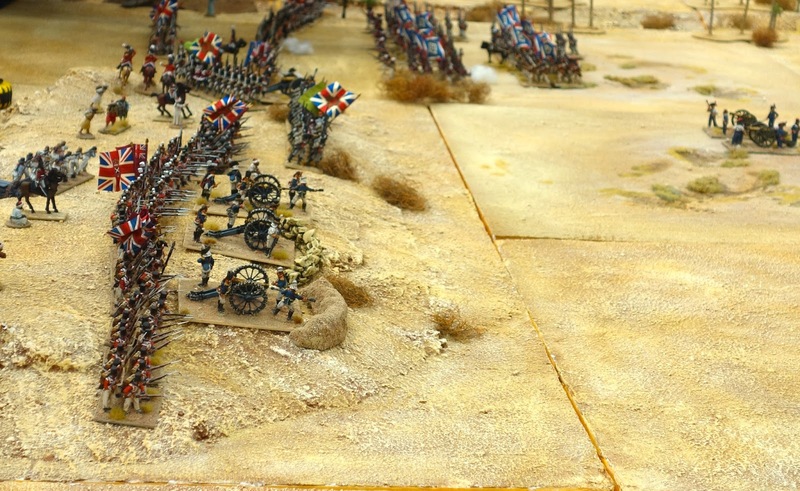 Probably my favourite game by a whisker, and that only because I am 'into' the French Revolutionary Wars at the moment and just love (a) the Egyptian campaign and the British invasion in 1801, and (b) Perry's wonderful range of figures. It certainly gave me a few ideas for my French and English armies. (I am NOT going to get into this campaign!) The game was put on by the Perry twins and looked like the English were going to be hard pressed, but I suspect they would have sent the French columns reeling back at some point, as long as they were able to deal with all that French cavalry. 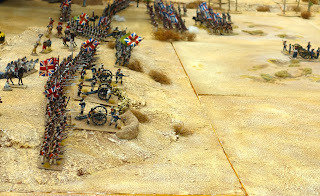 Another excellent game was Dave Docherty's of the Old Guard Wargamers Sudan game using Peter Gilder's old rules. There were thousands of Dervishes and Fuzzie-Wuzzies appearing all over the table and homing in on the beleaguered British zariba, complete with railway train and observation balloon (I want one!). The balloon was made out of a polystyrene sphere from Hobbycraft and the netting that onions are sold in. very effective it was too. All the figures were extremely well painted and the terrine looked great. Now I've never seen such a visually appealing naval game as this one, portraying the Naval battle outside the Russian naval base of Port Arthur on 9 February 1904, during the Russo-Japanese War, put on by the Derby club. Port Arthur was very nicely modelled and the ships (1/600 from Old Glory I think) were gorgeous. I've always had a bit of a soft spot for this war, especially the naval side, and did have the fleets in 1/2400 many years ago. I had been looking forward to seeing Steve Jones's depiction of the Battle of Bunker Hill at the start of the American Revolution. I follow Steve on his blog and love his figures and the way he presents his games. The terrain and figures were of course superb. I must get my stuff on the table again sometime soon. That's the end of part one. There are more photos of some dazzling games still to come as well as my overall thoughts of the event and an admission as to what I didn't realise I needed till I got there and just had to buy! (And thanks Robbie for grassing me up to Katherine who asked me, "Who's Mark Allen - she knew already as she has met him, and what does he do?" I had been seen buying some painted figures off him!). Super pictures Colin! You remembered to charge your phone this weekend then?